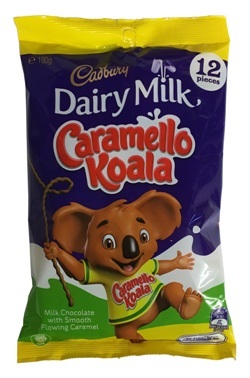 Get 12 of your favourite Caramello Koalas (15g) in this sharepack. Perfect for sharing, or not, if you love them so. Full Cream Milk , Sugar, Cocoa Butter, Wheat Glucose Syrup, Sweetened Condensed Milk, Milk Solids, Cocoa Mass, Golden Syrup, Invert Syrup, Palm Fat, Emulsifiers (Soy Lecithin, E476), Salt, Food Acid (E331), Flavours.